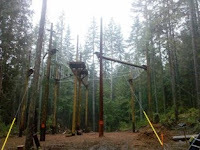 After about a month of hard labor in the rain, mud, ice, and snow the construction on the Brian Bradshaw Memorial High Ropes Course has been completed. Here are some pictures of the completed course. There will be a video showing the construction over time and a dedication event in the next few months. As you can see from the pictures there is still some work to be completed on the ground, but the construction in the air is done! wow that looks really great!! good luck with it! 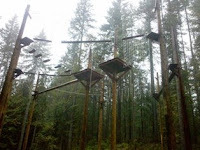 our local ropes course in maryland provided our church group with some challenges but a lot of fun!